On a late September afternoon, Kim and I rolled off Highway 31 onto Red House Road in south-central Oregon. The pavement lulled our citified Toyota Corolla into a premature sense of complacency. Just past the enormous ZX Ranch feedlot, the surface became a shuddering gravel washboard that eventually devolved into a bed of softball-sized rocks. We tacked northward across a shallow basin toward Diablo Mountain, stopping just beyond a dry water hole. Silence settled around us, broken occasionally by a whisking breeze. The midday sun was subdued, slouching in the southern bluestone sky, casting a blanket of 70-something warmth onto dusty gray sagebrush. Rabbitbrush blooms had mellowed from yellow to toasted marshmallow brown. This trip wasn’t exactly recreational. Kim and I had come to work at the fuzzy interface of science, art, coincidence, and over three decades of congenial companionship that has often included lizard hunting. Today we sought the diminutive Sagebrush Lizard. I outfitted each of two children’s fishing rods with a dental floss noose, and we traipsed off into their favorite habitat: sandy soil and chest high sagebrush. Finding Sagebrush Lizards means meandering and watching for a small gray streak zipping across loose soil. They zip because for eons Sagebrush Lizards have been the ecological cannon fodder of the High Desert. 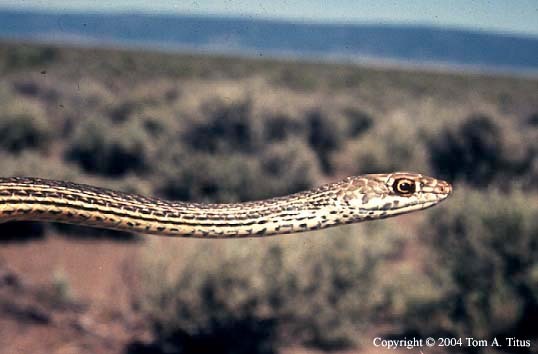 Everybody eats them: larger lizards, Whipsnakes, Racers, Shrikes, and Burrowing Owls see Sagebrush Lizards primarily as moving morsels of high-quality protein. As a result, they have evolved a level of wary evasiveness not often seen in larger animals with fewer daily threats. Fortunately, Sagebrush Lizards don’t zip very far. When they stop, you must locate the lizard, slip the dental floss loop around its head, and lift the scrabbling animal into your hand. Writing these instructions is a lot easier than implementation. The backstory that brought us to this lonely basin was detailed in my Oregon Quarterly article (Spring 2017) entitled “Lizard Tales” (http://www.oregonquarterly.com/lizard-tales). Twenty years of teaching herpetology led to a writing project that led to a pair of 12,200-year-old Sagebrush Lizard mummies excavated from Paisley Caves that led to a writing residency at Summer Lake that led to the beginning of the Sagebrush Lizard Genome Project. This was exciting and peculiar territory, where science blurred into art, happenstance overlapped with opportunism, and the literal blended with metaphorical. The goal of the Sagebrush Lizard Genome Project is to establish a modern DNA sequence template to which ancient DNA sequences from the Paisley Caves lizard mummies could be matched. Modern sequencing technology has spectacularly lowered both cost and effort and has moved genome sequencing from big labs with enormous resources into the hands of the many, or at least the hands of those with a handful of laboratory skills and access to a high-throughput DNA sequencing instrument. The Sagebrush Lizard Genome Project is an orphan, dirt-poor, grassroots program helped along by volunteer time, congenial people in the University of Oregon Genomics and Cell Characterization Core Facility, and materials donated by the biotechnology company Illumina. To date, sequencing has been accomplished using cutting edge and largely experimental methods. With these early low cost efforts the number of genes in the assembled sequences is on par with a published genome for the Carolina Anole, Anolis carolinensis, currently considered the most complete publicly available lizard genome. Kim and I were searching for lizards on this early autumn afternoon because the next step of the Sagebrush Lizard Genome Project required long-read DNA sequencing. These are about 20,000-30,000 DNA base pairs per sequencing read, and require long, unbroken strands of DNA. The fragment sizes of the DNA I had coerced from the tail of a female Sagebrush Lizard from this place almost exactly one year ago were too short. To acquire a new DNA sample of higher quality, we made this spur-of-the-moment midweek trip, trying to take advantage of perhaps the last warm days of the year. Winter can come early and dramatically to the High Desert. After about an hour of searching, the world of modern genome sequencing and the wild agnostic silence of a High Desert afternoon converged on a gray dart escaping into the shade of a large sagebrush. Kim and I teamed up, one on either side the shrub. The animal held still, but hid its head in a scruff of dry cheatgrass. I cussed. I cajoled. But I could not get the noose around that lizard. It streaked off, stopping in the open just short of the next bush. Using my best imitation of a slowly stalking cat, I closed the distance and slipped the loop over its head. Lifting upward, I brought the thrashing lizard, about the length of my middle finger, into my hand. The mottled blue throat and paired blue belly patches identified it as a male. Kim looked away, I apologized to the lizard, then popped off an inch of its tail. Because Sagebrush Lizards have for millennia been eaten by everything large enough to eat them, they have evolved fracture planes in the tail vertebrae that make tail dislocation and escape from predators very easy. Tail regrowth is a part of life. I placed the sample in a Ziploc bag and put it on ice in a small cooler. After some photos, the animal was released to do what Sagebrush Lizards do on an early autumn afternoon: eat without being eaten. We rattled the unfortunate Corolla back over the rocks and onto Highway 31. On the way home, we stopped at PLAYA, the creative arts institute where I spent one wonderful month of my life last fall. We strolled into the office wearing our dirty field clothes to say hello. Ellen Waterston, extraordinary Oregon writer and now the director, and John Martin, poet and residency manager, were unfazed by our appearance and welcomed us warmly. The four of us talked about new projects, new funding, writing, and big ideas at the interface of science and art. Home was still 200 miles distant, and a lizard tail waited in the cooler. Kim and I reluctantly took our leave. A few miles north is the Summer Lake Store, where we stopped for fuel and Fritos. Just north of Hole in the Ground, Kim took the wheel. A forest of big ponderosa pine glowed orange in the setting sun. In the closing darkness, I wandered into my head and wondered if I owed anything else to the fading day.